My favorite chart book for the quarter is out, via JP Morgan. As always, click for ginormous charts . . .
Data source info below . 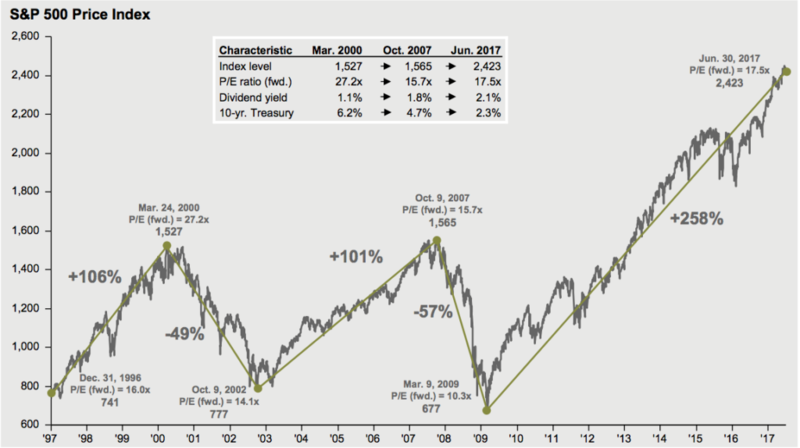 . .
Sources for S&P 500 Index at inflection points: Dividend yield is calculated as consensus estimates of dividends for the next 12 months, divided by most recent price, as provided by Compustat. Forward price to earnings ratio is a bottom-up calculation based on the most recent S&P 500 Index price, divided by consensus estimates for earnings in the next 12 months (NTM), and is provided by FactSet Market Aggregates. Returns are cumulative and based on S&P 500 Index price movement only, and do not include the reinvestment of dividends. Past performance is not indicative of future returns. Guide to the Markets – U.S. Data are as of June 30, 2017. Sources for S&P 500 valuation measures: FactSet, FRB, IBES, Robert Shiller, Standard & Poor’s, J.P. Morgan Asset Management: Price to earnings is price divided by consensus analyst estimates of earnings per share for the next 12 months as provided by IBES since December 1989, and FactSet for June 30, 2017. Average P/E and standard deviations are calculated using 25 years of FactSet history. Shiller’s P/E uses trailing 10-years of inflation-adjusted earnings as reported by companies. Dividend yield is calculated as the next 12-month consensus dividend divided by most recent price. 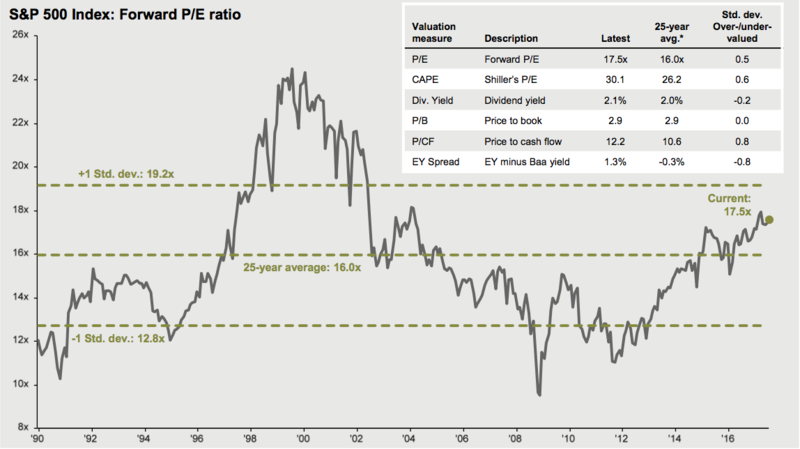 Price to book ratio is the price divided by book value per share. Price to cash flow is price divided by NTM cash flow. EY minus Baa yield is the forward earnings yield (consensus analyst estimates of EPS over the next 12 months divided by price) minus the Moody’s Baa seasoned corporate bond yield. Std. dev. over-/under-valued is calculated using the average and standard deviation over 25 years for each measure. *P/CF is a 20-year average due to cash flow data availability.